Hello faithful readers, and welcome to another exciting addition of my BIObus blog! Today I will be going over the take-down of our Grasslands sites (complete, of course, with a storm, our meeting with a group of students from Manitoba, and), a really cool beetle. Today was mostly spent taking down the sites we have been taking care of all week. Dismantling a site involves taking down our malaise traps, straining all of our water traps, and generally taking stock of the hail damage from the last two storms. On the way to our first site, I noticed a pair of beetles mating on a leaf. On closer inspection they turned out to be blister beetles (Meloe americanus in the family Meloidae). I’d never seen a blister beetle before, and I was really excited to see one, let alone two mating! Blister beetles have a chemical, cantharidin, in their blood that causes very nasty blistering if it comes in contact with human skin. If that’s not bad enough, they can release that nastiness from their knees when threatened. After some very careful prodding (using anything but our fingers!) we fiddled the mating pair into a jar of ethanol, and as of writing this blog they’re still held together in a macabre, yet beautiful, embrace. It must have been the mating season for a lot of Meloids, because we saw several similar looking species mating all over the grasslands. Very cool! The weather here is pretty crazy, but we made it through everything Saskatchewan threw at us! After we set down that site, we moved on to our riparian site, where we found all the pan traps demolished by hail. They say take only pictures and leave only footprints, and if the park staff are reading this, I would like to apologize for any tiny yellow plastic shards of obliterated pan trap we couldn’t find. Moving back to the visitor center, we said goodbye to the staff and had a lovely and surprising lunch with a group of students from Manitoba. They were studying architecture and learning the full meaning of prairies, from the geology to ecology. We helped them finish the last of their spaghetti, and headed off to our final site in the badlands, which was being darkened by another storm cloud. 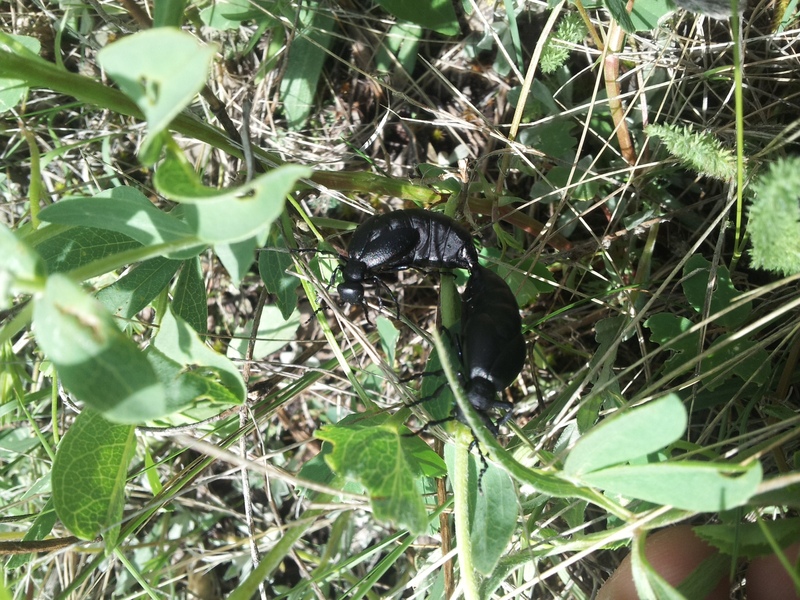 The happy blister beetle couple we found on our way to our site. They’re about an inch long each. While lightning storms are dangerous everywhere, they can be especially dangerous in the prairies where you can be the tallest thing for quite a while. After running to check up with the park staff if it was okay to drive, we raced to our final site. We must have set a world record for site dismantling; the quickly approaching thunder and darkening skies definitely spurred on our work. We got back to the RV just in time and got back with no issues. About thirty minutes later, the storm passed over and we enjoyed our final day in Grasslands. Laura Gardiner, our contact for Grasslands NP, said goodbye to us a few minutes ago, and we’re looking forward to a long day of driving ahead. Next stop, Revelstoke and Glacier! Hello! Danielle again, here to tell you about the BIOBus crew’s adventures in Grasslands. Today we ventured from our normal location, the East Block of Grasslands National Park, and drove to explore the West Block of Grasslands National Park. There is no direct route between the two blocks, so we had to drive north above the parks, and then head west. The whole journey between blocks took about two hours, and is a very scenic drive, filled with grasslands and amazing little small towns. A lot of these towns looked like they were built for the scene of a Western movie, which was amazing to see and we could really feel the history behind the towns. We stopped off in a town called Val Marie to get some Grasslands merchandise, including postcards to send back home, and we stopped in at the West Block Visitor Center. The West Block is the more popular of the two blocks because of the wildlife diversity they have. East Block has the incredible badlands landscape as well as the fossil histories, and West Block has a bison population of around 350, thousands of prairie dogs, a small population of burrowing owls and rattlesnakes, making it the more visited of the two blocks. We were directed towards a scenic “Eco-drive” along which we would pass through the park, in hopes of finding bison which were reportedly near the road, and prairie dogs, who had various burrow locations within the park. This group of bison were too close to the road for us to pass by, so we decided to take some pictures with them, from a safe distance of course! As soon as we entered the park we encountered a lone bison, just standing near the road. The general rule for the safe distance away from bison is: If you cannot cover the bison with your thumb in your field of vision then you are too close. Bison can be very skittish and charge vehicles if they feel threatened, so the rule of thumb was one we were adamant on following. Soon after we passed hundreds of little dirt mound with little black-tailed prairie dogs chatting and squeaking excitedly to each other. These adorable animals have historically been the subjects of poisoning, shooting, plague and flooding, to the extent where they now occupy only 2% of their historical habitat, so seeing so many of them in one place was incredible. Soon afterwards we found some more bison, just over 20 of them, and they were right on the road, so we had plenty of opportunity to take pictures while we waited for them to move along so that we could pass safely. The bison also have a sad history, once 60 million strong across the North American plains, they were hunted to near extinction in the 1800s, and now there is a massive conservation and recovery effort to try and boost the number of wild bison, seeing the amount we did was an amazing privilege and definitely humbling. 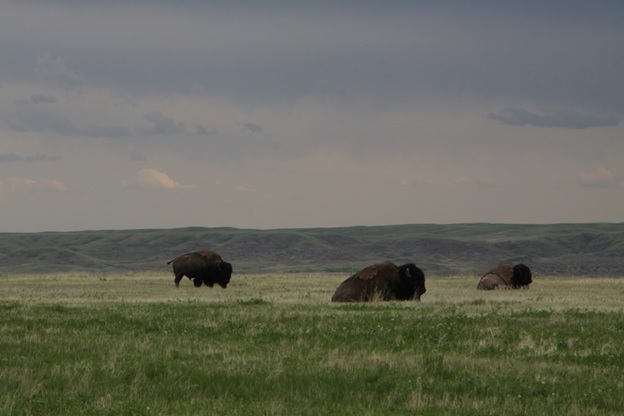 A closer look at the American Bison (Bison bison) of the West Block of Grasslands National Park. We also could not miss the opportunity to sample, because we are scientists! We got on some of our gear, and hopped on down to a nearby creek for some aquatic sampling. There were bison and deer tracks all along the river, and we even found some crayfish that had been stamped on by the bison coming to the river to drink. We had to cut our sampling short however because of an encroaching thunderstorm, and we began to head back to our current lodging at Poverty Ridge. We did not get all the way to Poverty Ridge where we were camped though, the thunderstorm flooded our road, and – on the advice of a safety official – waited half an hour for the water level to recede enough that we could drive across safely. We ended up finding a campsite not too far from that point, as it was not safe to continue driving. Signing off from the rain-pounded BIObus!